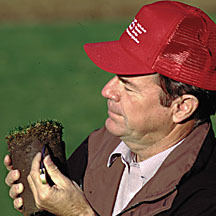 TifSport was developed by USDA/ARS geneticist Dr. Wayne Hanna at the University of Georgia Coastal Plains Experiment Station in Tifton, Georgia. This is the same breeding progam initiated by Dr. Glen Burton, the program responsible for Tifgreen, Tifdwarf, TifEagle and Tifway 41. In response to worries over the genetic vulnerabilty of Tifway combined with the search for a more cold hardy bermudagrass, Dr. Hanna and his team identified a number of characteristics that they felt were key for athletic fields, golf courses, as well as lawns and landscapes. According to Dr. Hanna, "We wanted a grass with superior color, cold hardiness and disease resistance.We also felt that rapid recovery from injury was vital, so we concentrated on turf density, turf strength and turf quality. And last but not least, TifSport had to be able to tolerate frequent lower mowing heights. We've been evaluating TifSport since the early 1980's, and all of our research as well as scores of "real world" installations confirm that TifSport performs to the standards it was bred for. It exhibits excellent cold tolerance, color, texture and density; improved pest tolerance and aggressive establishment.